It has been a little while since I last posted. My hope has been that one of these days (or nights) I would strike it rich with numerous trophy-size fish and then I'd have some great success stories to share with you. But, unfortunately the stars haven't been aligning for me lately, and things just haven't been working out very well on the water this past week. The only success that I really do have to share with you comes from a morning trip I took last week with my nephew Bailey. We headed out fairly early one morning to fish a certain stretch of river where I had done well previously. When we arrived to the area however, we found someone else already fishing it. So we decided exercise a little bit of angler courtesy and head to somewhere else. It was a bummer for us, but proof that oftentimes the early bird does get the worm... at least he did that day. The area that we did end up fishing wasn't a complete bust however. 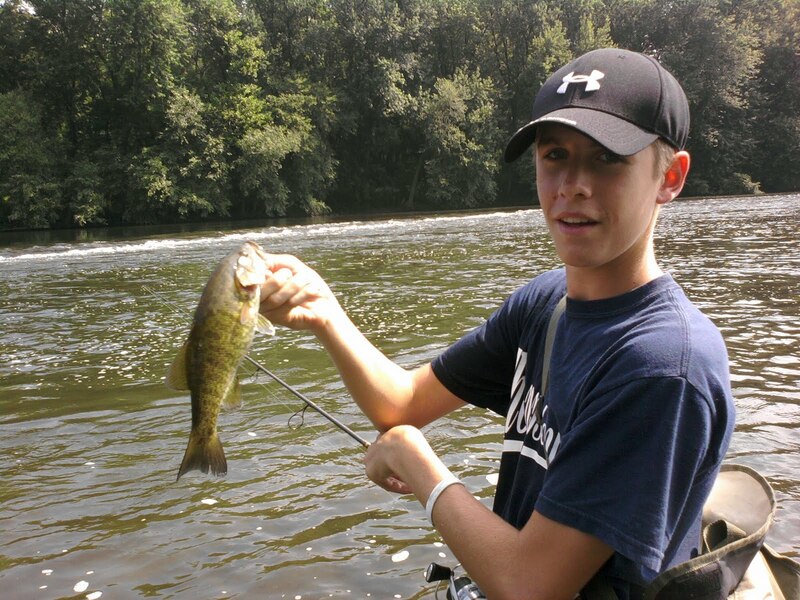 I had a great time wading and fishing with Bailey, and in the end we did catch 5 or so fish a piece. They were pretty small fish and the action was a little slow, but it was action nonetheless. We also got inundated by a huge pod of float tubers, who floated right through what could have been the best water we were going to fish that morning... It was another bummer, but at least they gave us a decent excuse for not catching more fish, ha ha. 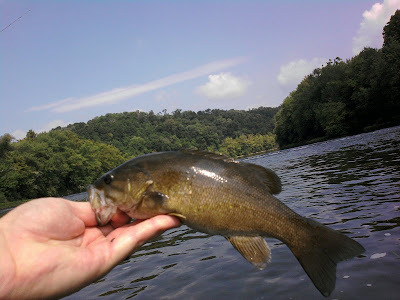 In addition to losing our first spot to another angler, and then having the float tube brigade spoil our new spot, we also had a third (that's right THIRD) bummer occur during our trip. 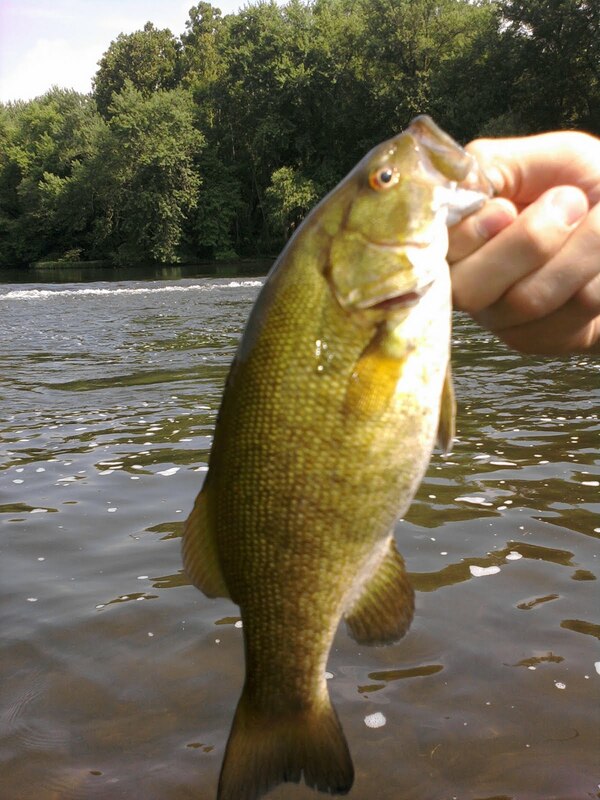 I had hooked a scrappy little smallmouth, fought him in to my side, and when I leaned over to grab him, my cell phone slipped out of my front shirt pocket and went right into the river. "Plop!" The plop heard 'round the world...Bummer number THREE! Still, this occurrence did prove one thing to me--that I am truly, without-a-doubt 100% a fisherman... I have come to this conclusion because instead of feeling remorse when I watched my nice new cell phone sink to the bottom of the river. My first reaction was that I couldn't help but admire the enticing flutter and side-to-side action that it had on the fall. Heck if I was a fish, I would have bit that cell phone! Lol... That was my initial reaction, and I'm kind of proud of that, ha ha. Aside from my trip with Bailey, I really haven't been doing much catching this past week. I did pick up a decent largemouth one day on my way to work, but that is about it. I have been fishing mostly at night, and I've been targeting mostly largemouths... but I have done a little musky fishing, and some hybrid striper fishing as well. With the full moon that we just had, I though the night fishing would have been a little bit better, but it wasn't... Still, I can chalk it all up as lessons learned and time spent on the water. I'm constantly getting one trip to closer to catching that monster.